We've just won the war, confound it. We're entitled to a bit of celebrating and cheering, to be happy, to laugh, pat ourselves on the back and say, 'job well done'. What we got instead was The Best Years of Our Lives, a reminder that sometimes war goes on long after the shooting stops. It was a curious message to give audiences who had been fed a series of films celebrating the men who were fighting in distant lands and the women who waited for them. However, it might have been the message audiences needed, if not necessarily wanted. The Best Years of Our Lives revolve around three veterans returning to their hometown after the Second World War, each different in civilian life but similar in the emotional impact the war has had on them. Al Stephenson (Fredric March), a sergeant, returns to his WASP job as a banker and his WASP home: his patient wife Milly (Myrna Loy), and children Peggy (Teresa Wright) and Rob (Michael Hall). Captain Fred Derry (Dana Andrews), from literally the wrong side of the tracks, comes home to his bride Marie (Virginia Mayo), but given they married right before he went off and didn't know each other well the homecoming is fraught with uncertainty. Petty Officer Homer Parrish (Harold Russell) may have survived to come home to his middle-class parents and his sweetheart, the literal girl-next-girl Wilma (Cathy O'Donnell), but he returns without his hands. They have been replaced with hooks. The three meet on the plane carrying them to Boone City, your nondescript Middle America town. Over the course of the film their lives intersect, sometimes at Butch's Bar, the watering hole owned by Homer's uncle Butch (Hoagy Carmichael). Al finds himself returning to a home with children he doesn't know all that well (and given that Rob all but disappears after the first hour, it's no surprise). Back at the bank, he is made Vice President of G.I. Small Loans, but when he approves a loan to a veteran with no collateral due to the veteran's character over his financial abilities, he is highly questioned. Al, a functioning alcoholic, starts seeing a world no longer as how he remembers it. Derry, who before his daring exploits was a simple soda jerk, finds readjustment hard too. While once heroic in the air, he finds that Marie is more interested in having good times than settling down. Furthermore, she wants the daring and dashing Captain Derry, not the regular-guy Fred, who in order to make ends meet goes back to his old shop. First attempting to sell perfume at the chain store that took over the old pharmacy (and having to endure the arrogance of the man he had once trained now as his stuck-up supervisor), he either was demoted or shifted back to the soda counter. It also doesn't help that he and Peggy have fallen in love, so much so that Peggy openly tells her parents she'll break up their already-faltering marriage. Homer Parrish is stuck in a difficult situation. Although he seems accepting of no longer having hands, he is surrounded by people who either want to ignore the obvious or be exceptionally 'accomodating' to his needs. Butch is the only one in his immediate circle who treats him as the Homer pre-war, even giving him piano lessons (yes, piano lessons). Homer himself thinks he's doing well by trying to push Wilma away, she fights for her man. Their lives continue to cross: Fred loses his job at the soda counter when a radical insinuates to Homer that he had lost his hands (and his fellow shipmates their lives) due to false pretenses, Fred and Marie begin to divorce but Al insists that Fred stay away from Peggy, and Homer and Wilma in the end marry with Fred as the best man and the Stephensons sans Rob as guests. At their wedding, through all the difficulties Peggy and Fred may face (despite his new job as a prefabricated homebuilder, dismantling planes), they acknowledge their love. The Best Years of Our Lives has not lost its power or relevance over the years since its premiere. It is built on many aspects, starting from Robert E. Sherwood's adaptation of the MacKinlay Kantor novel. Each of the characters are ordinary people, attempting to restart a life interrupted by war. In their struggles they attempt to deal with the changes both within themselves and around them the best way they can. We have three men, each from a different socioeconomic background and worldview, brought together by their shared experiences, and The Best Years of Our Lives shows how each man, rather ordinary in his way, does his best to both accept things as they are and build as good a life as possible. William Wyler doesn't give us "big" moments, places where a character makes a sudden realization or finds a great turn of events (with the exception of when Derry basically is at the right place at the right time to find a job that will keep him in Boone City, but then the love story would have pretty much been thrown out if that had happened). Instead, the director kept things to the most basic level, but in this we see the genius of The Best Years of Our Lives: this is really OUR story, any of OUR stories, any person who was either going through a situation like this or knew someone going through a situation like this. Given we had just survived this particularly brutal war, any viewer would have seen him/herself in any of the characters: those who came back to a secure job and home to those who returned to neither to the women who loved them. The Best Years of Our Lives is on the whole so authentic to wartime experiences that it could easily be seen today and still be seen as something contemporary. It is filled with such beautiful moments, in particular when the men first return to their various homes. Each time we see one of the men arrive we are filled with great emotion: Homer's mother, devastated by the loss of his hands and doing her best to put on a brave face, Millie unaware that her husband has come home until neither child answers her question as to who was at the door then coming to the hall, Phillip coming to find his wartime wife not waiting for him. If Al or Homer's homecoming doesn't fill one with a hint of emotion or the formation of tears, one can only wonder what kind of person that is. Now, let me turn to some of the things I didn't like about The Best Years of Our Lives. Let's start with that love story between Phillip and Peggy. I've seen the film twice and while I didn't find that aspect of the film as boring the second time as I did the first, I just figured this served to stretch the film to its nearly three-hour length. The movie slowly shifts from the story of the three veterans attempting to rebuild their lives into this tale of thwarted lovers. I figure we had to have a love story somewhere in all this, but I simply could not warm up to this part of the story. As good as Mayo is in the film as the insensitive Marie, I wonder if she had to be such a shrew: vain, selfish, almost a golddigger-type. I wonder if this was done to A.) give Peggy and Phillip a complication and B.) make it acceptable for him to be romancing, ever-so-hesitantly, a woman not his wife. 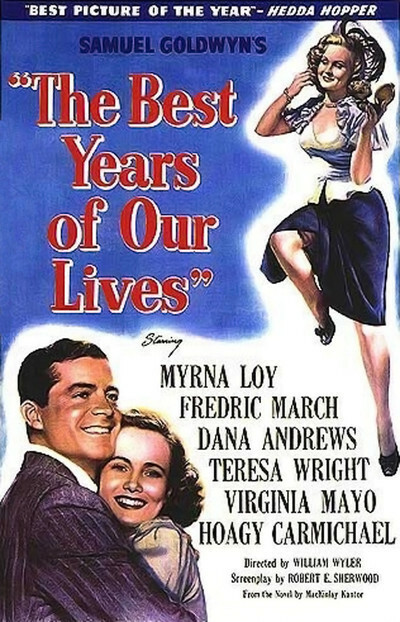 I also was concerned that Best Years of Our Lives was almost playing Al's burgeoning alcoholic binges for laughs (especially bizarre given we've just had the previous Best Picture winner revolve around alcoholism). Early on in the film, Al wants to tear up the town with Millie and Peggy (conviniently leaving Robbie behind). Besides wondering why Millie would be so painfully patient and understanding as her husband keeps getting drunker and basically making her and Peggy bar-hop, the hangover also seemed to be on the lighter side. Later on, a slightly intoxicated Al gives a speech basically harranging his superiors for basically putting profit over people. My beef with this aspect is that it might have been playing light with something that now would be seen as cause for alarm. Finally, speaking of Rob, few characters have been as short-shifted as the Stephenson's youngest son. Rob appeared to be there just to be able to give a little anti-nuclear bomb statement, then rushes off to school...to never be seen or heard from again. I marvelled that at Homer & Wilma's wedding, he didn't show up and no explanation was given for his absence. He appeared to be Chucky Cunningham before there was a Chucky Cunningham. These on the whole are minor flaws, because so much about The Best Years of Our Lives is so beautiful. The performances are all so excellent, from Marlene Aames' Luella (Homer's sweet little sister) to Teresa Wright's luminous performance as the lovelorn Peggy. While Myrna Loy received top billing, she was clearly a supporting performance as the wise and patient Millie, but she was total perfection as not just the perfect wife and mother but as a woman. While Al rages about Peggy going with a married man, Millie understands that her daughter's heart is leading her head. She sees things as more complex than Al does, giving her a deeper dimension that speaks more about her than about her husband. As already stated, Mayo was excellent as the shrewish Marie, and Andrews was equally brilliant as Phillip, a man who finds himself adrift now that his exploits amount to nothing in the civilian world. His Derry seems to be constantly holding in his frustration, his anger, barely within himself, working to accept things as they are but still hoping to move past everything. March to my mind might sometimes slip into comedy as the borderline alcoholic Al, but he also expresses that he simply is not the same man he was when he left the comforts of upper-class society. The term 'courageous' is wildly overused in film. I find nothing 'courageous' in two wildly heterosexual men playing gay characters (think Heath Ledger and Jake Gyllenhaal in Brokeback Mountain). However, 'courageous' is the only term appropriate for Harold Russell's performance. He was an untrained actor when he made his debut, and his performance is so authentic one can see he brought true nobility to all those who came back from war physically disabled. Homer never drowned in self-pity, wondering, 'why me', but worked to continue his life with dignity and yes, courage. It was a brave performance, winning him TWO Oscars: a special Oscar "for bringing hope and courage to his fellow veterans through his appearance" as well as Best Supporting Actor. 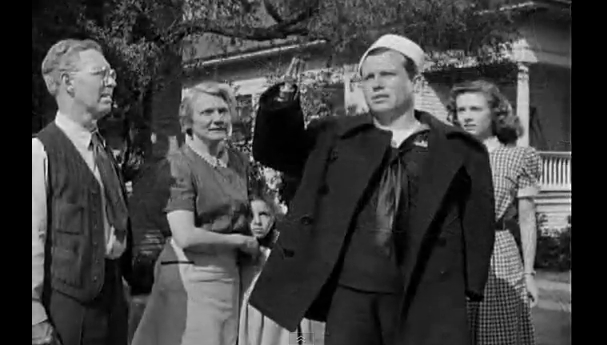 Harold Russell earned both honors, for in his appearance he did bring hope and courage, but he also had a strong performance of the wounded veteran, especially given he was not a professional actor. 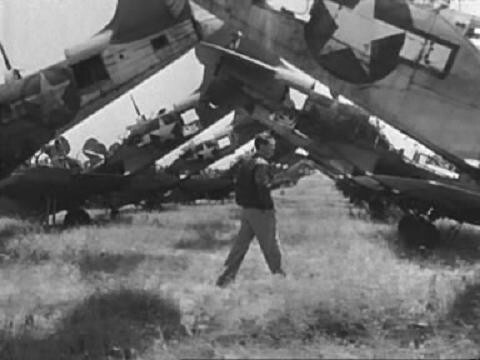 Curiously, as a side note, the third veteran (the role Russell played) was meant to be suffering from shell-shock, and we do get a sense that an aspect of that was shifted to Dana Andrews' character. He has dreams about a mission, but this line is never followed through. My personal view is that it was a version of the shell-shock the third character would have suffered from just transferred to another character, but not explored. The Best Years of Our Lives is a bit long and gets diverted by the romance between Phillip and Peggy, which sometimes takes center stage. However, it is too good to ever age. As more veterans continue to return from all theaters of war, from Korea to Afghanistan, The Best Years of Our Lives will always be relevant, vital, important, and true to life. Please visit the Best Picture Retrospective for reviews of all Oscar winners in the top category.